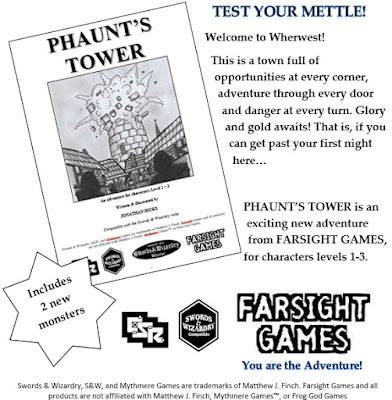 All being well, my first OST adventure 'Phaunt's Tower' will be available from RPGNow and DrivethruRPG on Monday 3rd September. I just have two or three tweaks to make and it will be live on Monday afternoon (GMT). It's been hard work to get to this point and there are a lot of people I'd like to thank, but I'd like to extend a special thank you to Kevin Watson of Dark Naga Adventures for his help and advice. So, I'm taking a dive into the tabletop RPG industry - I've written for Fighting Fantasy but that was for a publisher, and what I want to do is something completely of my own design. 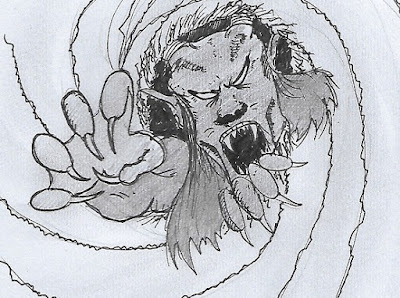 I'm hitting the OSR circuit and using Swords & Wizardry (primarily Whitebox) as my chosen system as it appeals to me creatively, and right now it covers all three of my favourite genres; fantasy (S&W), science fiction (White Star) and horror (Eldritch Tales). I'll have my first adventure out soon, 'Phaunt's Tower', and I'll follow that up with another fantasy one called 'The Battle of Halfpass'. I'll have a sci-fi one done soon called 'The White Worlds', and I've started a Cthulhu horror one for Eldritch Tales which is going to be much larger and more epic, called 'The Dream of Dead Gods'. I've been working on these on and off since March but now I'm going to hit them hard. It'll also be good to stretch my artistic abilities and really challenge myself with drawings. I'm not a professional artist but I really enjoy illustrating my own work and I have a soft spot for the old-school black and white art from the 1980s. One day, perhaps I could make a living out of it! I've decided to write, illustrate and release an OSR adventure and to try and stay with that old-school feel I had a play at an old-style print-mag inspired advertisement. I tried to make the ad look as retro as I could so I used whatever Word tools were to hand, then copied it to Paint. I'm quite pleased with it. The adventure itself will be released soon. Every year on Christmas Eve the company department my wife worked would hold a morning of team-building exercises. This can take the form of crafts, boardgames, or anything else that takes their fancy, anything that makes them work together. One year, my wife convinced them to play D&D. The original plan was for me to show her a few pointers and for her to run the game, but as I wasn't working on Christmas Eve it was decided that it would be easier for me to DM. It was going to be a quick two-hour blast through a simple dungeon, and I figured it would keep them entertained for a while. 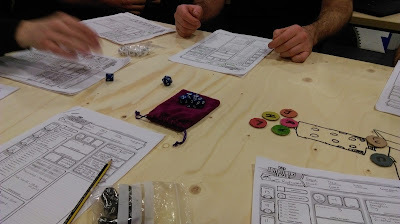 Now, these guys have virtually no experience with the tabletop hobby, let alone pen n' paper RPGs, so I was shocked when they really got into certain elements of the game even before I arrived on the scene. Characters had been created with detailed backgrounds, their role in the adventuring party had been worked out and they'd even made their own swords and weapons out of cardboard. At first, I had this feeling that it was going to be a bit of a piss-take game, and because they weren't gamers they wouldn't take it seriously. Well, didn't I feel like the prat when we started. They got well into it. A few minutes into the game and we were fighting giant rats in a cellar, which lead to a secret entrance to an abandoned dwarven tomb. There were conversations about tactics, shouts of encouragement, and the first victory of the game got a cheer. Then there was caution, questions, exploration, some encounters that created some real tension and fun moments, and a final confrontation that created some excitement and a satisfying climax. 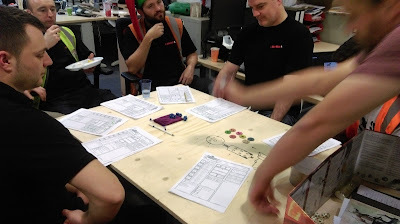 It was the energy from the players more than my abilities as a DM; there was nervous expectation and some trepidation, but once I showed them that they could be as relaxed as I was and that there were no expectations from them they settled in to the game quickly. It was great fun and I think some did it again, outside of work. I learned some valuable lessons with this session; for starters, don't pre-judge the game and the players. I expected some fun and a dismissive playstyle, a casual game of no real significance, but they seemed to enjoy the game and I had a great time with new players. Secondly, D&D is a great team-building game. They started out a little disparate but soon came together as a group to defeat the (hugely underpowered) dragon at the end. It was a great ending. Finally, always listen to your wife when she says 'you should do this'. You never know what you might miss out on. DUNE RPG on the way! Wow! I was talking about a Dune RPG today, and about how shocked I was that the license hasn't been picked up and now here's news from Gale Force Nine. Guess I should talk more about what games I'd like to see! BURBANK, CA – August 6, 2018 – Legendary Entertainment and Herbert Properties LLC have reached a multi-year licensing agreement with Gale Force Nine (GF9). The award-winning game publisher is now set to bring the beloved sci-fi franchise DUNE to the world of tabletop gaming. The agreement calls for Gale Force Nine to produce original tabletop games drawing from the full scope of the Dune franchise—spanning the many publications from Frank Herbert, Brian Herbert, and Kevin J. Anderson—along with multiple direct tie-ins with Legendary’s highly-anticipated film from director Denis Villeneuve. The full range of tabletop games, including board and miniatures games are slated to hit the market just prior to Legendary’s theatrical release of DUNE in 2020. In addition, GF9 plans to align with other game companies on numerous categories and formats in the future. I've done quite a lot of online gaming over the years. I started out as did many others, with World of Warcraft (just as the Liche King expansion came out) and then played quite a few other games; Warhammer Online, Rifts, Lord of the Rings, Star Trek, Star Wars, Guild Wars and many others that have been installed/uninstalled/reinstalled over the years. Many years ago D&D Online came out and, even though I did enjoy it, it didn't feel enough like a proper MMO for my tastes. I like the Eberron setting just fine, but never thought it was a good choice for the official D&D MMO and it never came close to the open-world fun of Warcraft; and, to be honest, I don't think any MMOs really do. I've begun to enjoy the Free-To-Play options in games lately as my time is limited and if I paid a subscription for a game I'd feel obliged to play it and end up sinking a lot of time into it. Even though a lot of the Free-To-Play games are a lot of fun, you hit a point where you can't really progress unless you spend money and you end up running around trying to find things to do. The D&D Neverwinter game has really changed my perspective on that. I've built a level 70 character decked out in decent gear across the board, and even though I'm sure that a few paid options would have got me to 70 faster and helped me take part in the high-level content really made the character excellent, I've not yet spent a single penny on the game. Although I used to play on PC I'm now playing on the PS4, and while I'd prefer to use a PC it works perfectly well. It's probably the best free MMO I've played and now I'm looking at spending some money on it. It's not as open world as I'd like, and you travel from the central Neverwinter city to zones scattered about the world - there are still other players around so you're not placed in these zones alone. The campaigns, such as Tyranny of Dragons and the Elemental Evil story, connect to the D&D 5th Edition tabletop roleplaying game so the MMO is keeping up with the new and improved edition. You don't need one to use the other - both mediums are doing their own thing - and there's constant new contetn being added with new campaigns and areas such as the upcoming Ravenloft expansion. 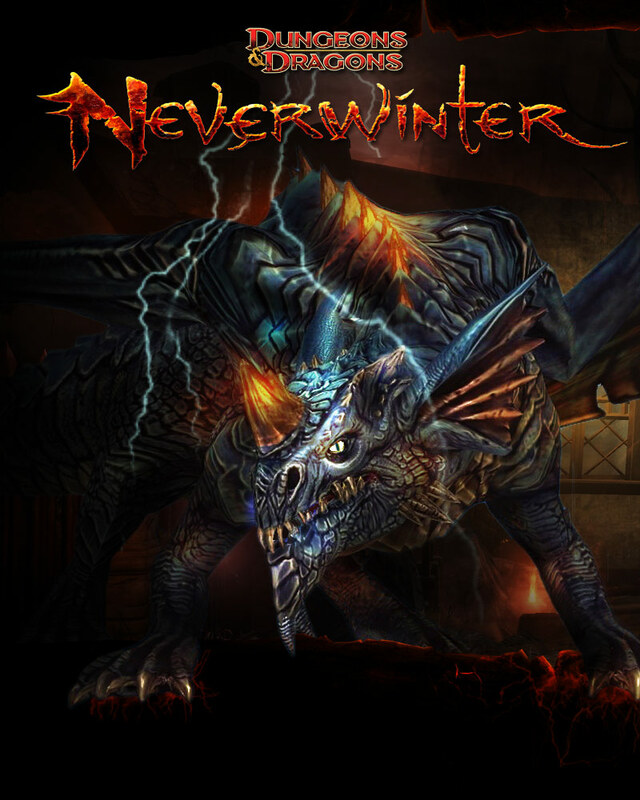 I can recommend Neverwinter for casual gamers like me, and even for paying players who want to get the most out of their game. There were plenty of games I either owned or had access to that I never truly dived into and yet always wished I had. There was so much I would have loved to have done with the settings and worlds they presented. Here are four of them. I managed to pick up a copy of the first edition book as I'd been looking at the recent editions and just wanted to get back into it. I remember looking through it when it first came out back in the early 1990s as we were in the middle of a Shadowrun game and the GM at the time wanted to run a similar game but using Earthdawn. I didn't know at the time that Earthdawn was the world eighteen thousand years before Shadowrun, and that you find out the true history of the awakened races that inhabit the future. I remember wanting to run a Shadowrun game that alluded to ancient artifacts, and then run an Earthdawn game that explained where the artifacts had come from. It never came to pass, and Earthdawn was put away. I've been reading up on it recently and so acquired this second hand copy, and all the original memories came flooding back. I wasn't a fan of the system at all, and to be honest if I ran it now I'd probably use the Runequest system. But the Mesoamerican feel, the takes on the different races, the idea of the Horrors and the people emerging from the Kaerns, which in turn gave a decent reason why there were dungeons to explore, instead of them just 'being there'... it was all fantastic, rich stuff and I'd run a game in this world in a heartbeat. I regret missing out on this game when it first appeared. My next campaign is going to be a science fiction Cthulhu game, but if my players asked me to run a fantasy game I'd use this setting in a flash. It's easy to see why it was I missed out on this; I'd already fallen out of love with AD&D 2nd Edition long before this campaign setting was published so let it pass me by, but I know if I had sat and read this when it first came out I would have dusted off my multiple polyhedrons from my Basic D&D boxset and set about running a campaign. I'd have even gritted my teeth and put up with THAC0. Birthright has everything I'd love to run in a fantasy setting, especially these days with the up-and-up of Game of Thrones and even such dramas as Pillars of the Earth. The intrigue, the political wrangling, the looming wars. There were lots of different kingdoms to choose from and plenty of scope with characters, backgrounds and adventures. I have the option of running a straight forward D&D dungeon bash, or a political intrigue game, or a murder mystery, or all three together. There's plenty to do in the Birthright campaign setting, and I was overjoyed to find the website www.birthright.net that had plenty of versions for download (all fan created). I downloaded them and absorbed the setting, but I'd still love to have the original boxset. This is probably the only reason I regret abandoning AD&D 2nd Edition. It's a great setting with a fantastic sense of depth and wonder. I played a little Traveller in the 1980s - sadly, the majority of the games were Star Wars inspired but lacking in any kind of adventure or excitement, but I enjoyed the game system immensely. When the West End Games Star Wars RPG supplied the pulp science fiction adventure I was looking for I then started to look for much more hard sci-fi games, the kind of games I wanted Traveller to supply me with. I found 2300AD: Man's Battle for the Stars in Virgin Megastore, at a time when Virgin Megastores had huge RPG sections, and the attendant told me 'yeah, it's kind of like an updated version of Traveller'. So I bought it, and found out later that it was nothing like the Traveller I remembered. So thank you, Virgin Megastore shop assistant, for not really knowing what you were talking about, even though you were right about the Traveller connections. 2300AD is a great game, with some very hard science fiction ideas and a great background, pretty much picking up the future 300 years from where GDW's Twilight: 2000 RPG left it. The system was pretty good, even though there was a lot of mathematics involved, but I thought this just added to the hard science fiction feel of the game. I wish I'd got a game off the ground and done a proper campaign with gamers who would appreciate a hard sci-fi game and were also really good at maths. I still have that hard sci-fi itch to scratch even after all these years. I've just got Traveller once again so maybe that'll help. To be fair, I didn't really miss out on this game - I just used it for a different purpose. I'm a huge 2000AD fan and I've got two decades worth of comics, graphic novels, Casebooks, Best Ofs, Megazines and specials. And a signed issue from John Wagner, Alan Grant, Simon Bisley and Colin MacNeil. So, yeah, I'm pretty much into it. The Judge Dredd RPG was released by Games Workshop in the 1980s and, as far as I can tell, did quite well. The system wasn't anything to write home about. In fact, it wasn't that good, being a basic roll-under-percentile-score system in which starting PCs had stupidly low scores. But, it was functional and could be modified quite easily (changing the Combat Skill score to the two scores Weapon Skill and Ballistic Skill a la WFRP solved many issues, and giving the player about fifty extra percentiles to divide up between the scores made them much more competent). I had the hardback book, not the boxset, and I used it quite a lot... for Strontium Dog games. My mates didn't really want to be Judges and with the mutation tables in the back it was perfect for a Stront game, and my mate Andy's Ralph the Goblinoid hunter had several months of fun. The reason I missed out on this game is because I never used it for it's intended purpose, roleplaying as a Judge. I had great plans for playing Brit-Cit judges, and even had ideas involving the Apocalypse War and Necropolis. But these ideas never came about because we were having too much fun playing S/D agents. I'd like to get hold of a copy of this game again, just the hardback rulebook. It was wonderfully atmospheric and captured the feel of 2000AD of the time really well. I'd love to have a proper go at it. I bought the printed version of White Box : Fantastic Medieval Adventure Game recently. I like this a lot. It's really well laid out, quick and easy, and I like the retro style of it. The artwork is simple but a lot of fun and the game itself is easy and malleable with a wonderful 1980s feel to it. I especially like the fact that they included both Descending and Ascending Armour Class (I'll be using Ascending, myself) and just got to the point of the system and the game, so it's aimed at people with experience in RPGs. I think I'll write an adventure for DrivethruRPG for this as a way of trying out new approaches to design with the D20 system. At the moment I've written three official Advanced Fighting Fantasy adventures but it will be great to do something with another system and release it for myself under my own steam and editorial control. I want to write my own material in my own setting! I want to see how I do on my own in the wild! I've raved about having an active imagination for years, so now's the time to prove it! Self publishing, here I come! So, my latest Advanced Fighting Fantasy 2nd Edition adventure, 'The Crooked King's Cup', has just been released. This is the third adventure I've written for AFF2e and it's part of a larger story I've had in my head for a few years. There is a final adventure I want to write just to bring two of the adventures, this one and Floating Dungeon, together. I was disappointed that I never did more art for this adventure but I simply did not have the time. I got one headshot drawn and drew the maps which was enough, but I think I'd like to do some more illustrations for the next one and fill it out a bit more. What was nice about 'The Crooked King's Cup' was the fact that I not only designed an adventure but that I also created a location, 'Marshfeld', for gaming groups to use at their leisure with history, some locations and a few personalities to fill it out. That was fun, and it's nice to feel that there's a tiny part of Allansia that I helped create. I have no idea when the next adventure will be done as I'm working on other things, but it'd be nice to do it casually over the next few months to allow me time to illustrate it. I have a story in mind that involves a lot more travel than the previous adventures, and I'm hoping it'll feel a lot more involved with a much more elaborate storyline. That remains to be seen, though, as I do enjoy the exploration and adventure aspects of my previous adventures. It's all great fun and feels really nice to have fun in a world I have a lot of affection for. Fighting Fantasy was my gateway into gaming 35 years ago, so to be here writing and illustrating for it is something else. There's so much more I'd love to do for it, but only time will tell. In other news, I picked up the White Box game as a book I could grab as I'm working on my current project. It's Swords & Wizardry compatible and the adventures I'm working on for publication will be following the OSR line, and I hope I can make it attractive to D&D players old and new. It's a great book and the artwork is a lot of fun, the kind of black and white ink art I hope to create for my work. Great stuff.